The Fallout series already preys on our basest fears by pitting us against giant radroaches and radscorpions. 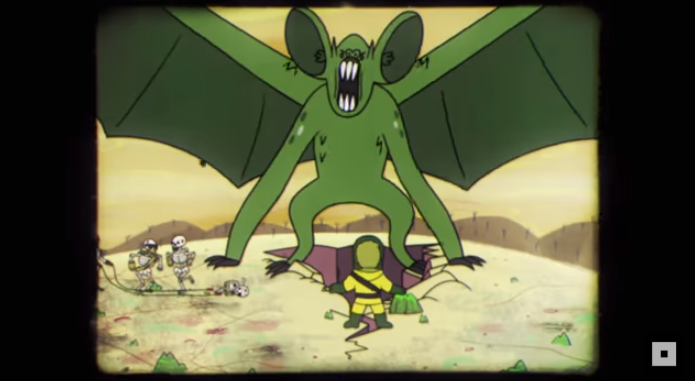 We've yet to encounter radspiders or radcentipedes ("Shut up Nadia, stop giving Bethesda ideas"), but Fallout 76 is the birthplace of one more critter meant to touch a common phobia: The massive radioactive bat called the Scorchbeast. I have an affinity for bats (and I suggest the like-minded amongst you read Kenneth Oppel's Silverwing series), so I'm sad at how readily myths about the only mammals capable of true flight blossom in the most fearful corners of our imaginations. We associate bats with death, with vampires, and with a uniquely horrifying brand of blind, bumbling malice that supposedly leads them to get snagged in our hair. Nearly every smear campaign launched against bats since the dawn of civilization is based on lies, but even I must admit watching the Scorchbeast wing its way through the skies of Appalachia is enough to give anyone the shudders. As you venture further away from the relative safety of the Vault in Fallout 76, you inevitably come across one of several deep fissures in the ground. These cracks are dangerous for a couple of reasons. One, if the green miasma belching from them isn't indication enough, they're highly radioactive (and if you're still slow on the uptake, getting close to the funk causes your Geiger counter to spin like a top). Falling into one of these hell-veins gives you a quick—and presumably messy—death. Two, Scorchbeasts emerge from these poisonous cradles. If you see a fissure, a Scorchbeast is probably nearby. If you're travelling alone, pray to the preferred deity(s) of your ancestors, and mind how you go. Though the Fallout series has a few monsters engineered to instill fear in low-level players—the Deathclaw comes to mind—it lacks a high-level encounter as visually striking as The Elders Scrolls' dragons. Fallout 76's Scorchbeast changes that. With its enormous, leathery wingspan and its radioactive sonar-weapon, the Scorchbeast can certainly be described as "draconic." As imposing as the Scorchbeast looks when it's wheeling in the air, at least you can see it clearly—and know to stay the hell away unless you're good and ready for a fight to the death. When I spotted my first Scorchbeast winging through the sky, I felt the same instinctive alarm I felt when I saw my first dragons in Skyrim. Even though a Scorchbeast doesn't kill you so much as it erases you when you're a level-7 babe just out of the Vault, I appreciate Bethesda made another game that makes me feel that unique low-key terror. Don't think you're any better off if the Scorchbeast lands in front of you, though. Even harmless little brown bats carry connotations of danger when they're ground-bound; one reason a bat might hobble across your driveway is because it's stricken with rabies. Though a landed Scorchbeast can still blast you with its sonar and administer a devastating claw attack, it also sheds a natural radioactivity that eats into you that much more easily when you're face-to-snout with it. The Scorchbeast's sprawling, spider-like gait gives me the willies, too. I like bats, but that doesn't mean I like watching them trundle against the mercy of gravity. Oh no, baby, you belong in the sky. Get the hell away from me, baby. Beating high-level monsters like Scorchbeasts appears to be one way to get the codes necessary to set off nukes in Fallout 76. Wrangling and destroying a Scorchbeast is certainly a job for a crowd. One developer admitted a single level-50 player still might have a tough time taking one of the monsters down. I asked another developer who'd win in a fight against a Scorchbeast and a Deathclaw (I was the kind of kid who breathlessly asked teachers if a lion can beat up a tiger), and "Scorchbeast" was the immediate answer. Its ability to fly and its sonar "breath weapon" makes it a skyborne horror show. When you play Fallout 76 in November, make sure you keep an eye on the skies. If you want an early go at the Scorchbeast, read our guide on how to sign up for the Fallout 76 beta. You can also check out all the Fallout 76 guides we already have going.